One highlight of the summer was designing our own Louisville Slugger Custom bat. Below we discuss and highlight our process and give some ideas as to what might help you in your quest for the perfect wood bat. Louisville’s site to customize can be found here. As an overview, Slugger’s make-your-own wood bat site is replete with the most comprehensive insight on wood bat turns, models and types we have ever seen. It also lets you build a custom wood bat just like any MLB Pro player to the finest detail. 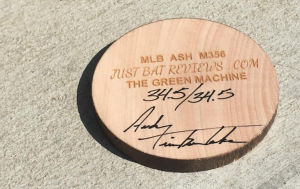 Any bat lover, especially in the wood space, will get a kick out of the hundreds and hundreds of options and the ability to customize nearly every feature of your bat. We spent no less than an hour playing with the numerous features, and unsurprisingly it reminded us of the DeMarini Custom Bat site that Wilson released last year. Slugger clearly took a page from their counterpart in the space and designed this wood bat custom page with this in mind. For starters, we chose ash. Why? Simple. We want this bat to look beautiful, and we don’t want an ink dot test throwing off our look. Ash doesn’t need an ink dot. We also chose the M356 in a 34.5/34.5 Ash bat. We did not cup the end as this was going to be a display bat. Inspired by the source of all wood bats, we chose the colors of a tree for our design. That is, a black and brown trunk and a green barrel with yellow leaves, throwing in a blue accent prime and a shiny silver logo for fun. The bat is called the Green Machine. If this is your first run at the wood bat space, we suggest an ash bat for its lighter swing and more forgiving mishits. Birch, if you want to be a rebel, is also a legit option for a bit of a lighter swing. If you couldn’t care less about hand sting and want the beast of wood bombs, we recommend maple. The traditional, tight grain structure and hardness are noticeable. The bats start at $169.99 and come in your option of maple, ash or birch. Maple is still the most popular bat type thanks to its revolution in the 1990’s. The bat structure is ultra hard and gives as much durability as you can find in the space. Maple’s sound at impact is what you dream about. Ash bats are the longest running bat wood in the MLB. This is for good reason. Ash bats tend to be less dense and lighter. They also come with a wider grain structure and have a more flexibility than maple. Birch, the newer kid on the block, tries to combine the best of the maple in its hardness with the forgiveness of the ash. A number of MLB player use this too. If you are fretting over which option to choose in your Louisville Slugger MLB Custom Bat, rest at ease, there really is no bad option. MLB players use each of these wood types regularly, and a handful of players use different types of wood often. 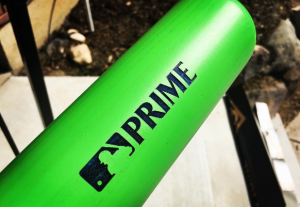 The next conundrum on your way to creating your custom Louisville Slugger MLB Prime bat will be deciding the dimensions of the different parts of the bat. The different models are referred to as “Turns.” Louisville Slugger has been responsible for creating over 6,000 repeatable models in the industry. Luckily, they narrow down your choices on their custom site to a more manageable 15ish. These options can substantially change the hitting experience (for better or worse) for any given player. Swing speed and bat mass are significant contributing factors in batted ball speed. On the whole, those who prefer or need a lighter swing should work for a longer taper, smaller ultimate barrel diameter. Those who really dislike hand-sting may benefit from a thicker handle and more tapered knob. matte, glossy or distressed look finish. Colors are everything under the sun. And Slugger’s partnership with Lizard Sking Grips allows you to add any number of Lizard Skin Grips to the bat. 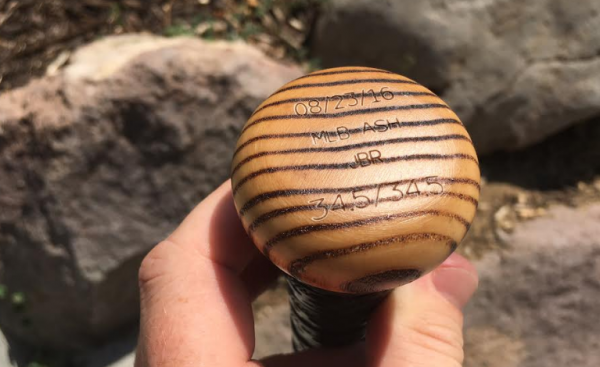 Whether you’re in the market for a serious MLB quality game bat with a bit of your own personal flare, a keepsake, Father’s Day or graduation gift, we’d be hard pressed to not slobber through our recommendation of a custom made MLB quality stick from the official wood bat company of MLB baseball. These ink-dot and game ready sticks are turned on the same lathes that produce game day bats for many a big league boy (and minor league boy for that matter). The quality is unsurpassed, and the options on this new custom site for Louisville Slugger are unrivaled. 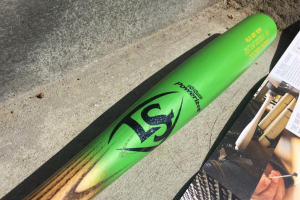 If you like the idea of a custom stick, but are looking for a cheaper option (around $80) you can check out Louisville Slugger’s MLB Authentic stick—you lose much of the personalization, but the bats are the same high quality ink-dot ready bats from maple, ash or birch with at least a little bit of flare (we reviewed those last year when they came out). In the event you often swing for sliders toward the hands in the mid to low 80 mph range, we suggest these Authentic Sticks (unless, of course, you have endless supplies of money). 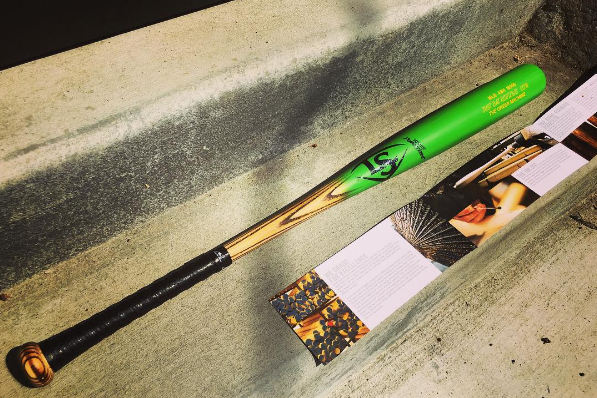 But, for the Sunday league player who does a great job of keeping bats, or the parent, spouse or individual looking for that very special touch in a dugout wow moment, go design, buy and jack some bombs with a Custom MLB Prime Bat of your very own. Feel free to design your own bat and then, at the purchase screen, email us your designs. We’d love to see what you got at admin@justbatreviews.com. And if none of that got you amped, these should. Previous: Previous post: Flat Seam vs Raised Seam Baseball | Did the NCAA Experiment Work?